I’ve run the same loop the past two days in a row. Yesterday it was wet and raw and still snowing—sleeting, more like. On the water, an April storm can be just as cold as a January one. It’s a seven-mile run. I run it once or twice a month, but rarely on consecutive days. I hadn’t planned to do it again yesterday, but I found myself going forward instead of turning around at mile 2, then 3. I needed to remember it all again, to keep remembering it—to see what else might jar loose onto the pavement from my body, from my mind. I’ve been writing about the day in the spring of 2012 when my husband and I had the conversation to separate, the day I took the same run for the first time, when the sensation of running both towards and away from something was so urgent I felt I might spin right off the land into the deep, endless waters. 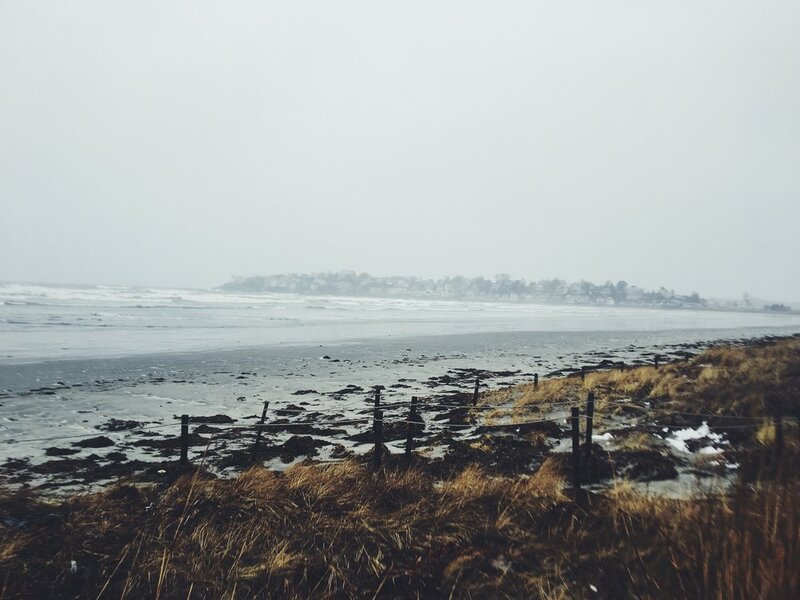 The feeling rushed back to me again yesterday so intensely, as I turned up the steep hill onto Little Nahant, where rows of small grey houses sit like teeth on the shoreline, that I reflexively squeezed my hands into fists and pulled my arms into my chest with a big gasp. On the exhale I flung my arms toward the ground, flicking my fingers and shaking my head like a dog shaking off water. These bits of the book have been the most difficult to write—the parts about him and me, our coming together and breaking apart. This surprises me, though perhaps it shouldn’t. If anything five years later I’m learning most things in life are both complicated and simple, but nothing so much as marriage. Many competing truths can exist at once: I loved him and I also had to go. I love him still—maybe more than ever today—and it’s also right we aren’t together. This particular stretch of shoreline is more animated than most. High tide brings the water right up to the breaking wall, where waves crash and often splash right up the walking path, and sometimes even the road. Low tide pulls the waterline out 500 feet or more, exposing the long, flat shore, which sometimes lays as smooth as a black marble, and at others is ragged, and covered in a blanket of red seaweed. It never ceases to surprise me: how much it changes, how often. Days like yesterday, during a storm, I find it the most beautiful. It rages, powerful, full, and white. It’s a mile long semi-circle of bay that extends from my town south toward Lynn, then Boston. You can see the city skyline clearly on the way out and I’ve always found that heartening—to have my city close enough that I can feel the comfort of its presence, but far enough in the distance that I can fully appreciate its shape. Like watching a lover in conversation across the room when they don’t know they’re being watched; sometimes perspective is everything. More often than not on these runs, I think of a line from Terrible Love, a song by The National. What does that actually mean, though? That the force of an ocean holds us together? That the ocean never actually breaks fully, even as the tide breaks over and over? Like all the best poetry and music, I’ve never really examined the meaning too closely. David Whyte says that poetry is the language for which our ego has no defense, and I would say music is, too. At least for me. I don’t need to understand why its true to know that it is. Just like all those competing truths in my marriage. I was being let go. This stretch of shore has witnessed so much of me. It has turned me over to myself, time and again. It saw the last days of my marriage, the last days of my drinking. It saw the impossibility in both scenarios and it urged me to press on, just the next step, toward and away from this life. On the way out yesterday, for the first 3.5 miles, I had a tailwind. Large, wet flakes flew forward from behind me and melted into the wet concrete. It felt easy, like being carried, and strangely warm. I didn’t have to tuck my hands into the sleeves of my shirt or brush the wetness off my legs like I did on the way back. I felt strong and sure, my gait steady and powerful, even on the stretches where I ran on the sand. But the way back was a different story. I hadn’t realized how strong the wind was until I turned to run into it. And the snowflakes that seemed fluffy and soft on the way out were now small, frozen, and hell bent on stinging my eyes. I couldn’t look too far in front of me at all, and for a mile or more I had to shield my face with my forearm just to keep going. At one point I laughed out loud at the absurdity of it all; the running, like the writing, like the sobriety, is sometimes only possible in this moment, and then the next, and then the next. When I arrived home after yesterday’s run, soaked to the bone and frozen, I turned on the shower and let the warm water run over me until my skin stopped stinging. I thought about all the answers the ocean has given me since that day in 2012. Newer PostAm I an Alcoholic?